Supreme Court: Uphold the Voting Rights Act! Section 5 is as necessary today as it was in 1965, when Alabama state troopers beat freedom marchers in Selma. At the time of Bloody Sunday, only 393 of the 15,000 black voting-age residents of Selma’s Dallas County were registered to vote. Today Selma has a black mayor, a black congresswoman and six black city council members. 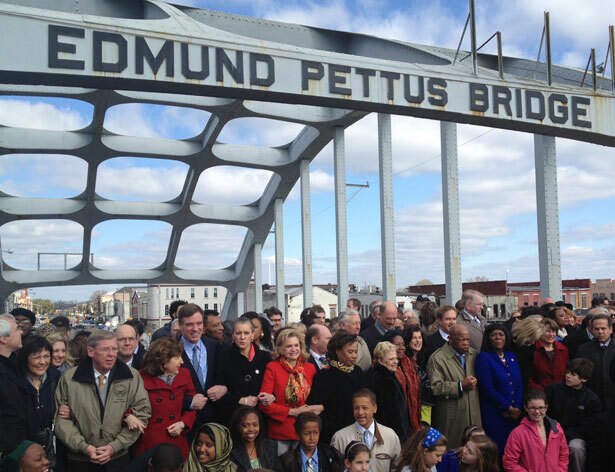 Since 2000, Lewis has led a congressional pilgrimage to Selma for every anniversary of Bloody Sunday, paying homage to how the VRA transformed American democracy. This year’s march had special significance. To Kennedy and his conservative colleagues, states with a historic record of discrimination—such as Lewis’s home state of Alabama, where the current challenge originates—are now the ones being discriminated against. “If Alabama wants to have monuments to the heroes of the civil rights movement, if it wants to acknowledge the wrongs of its past, is it better off doing that if it’s an…independent sovereign or if it’s under the trusteeship of the United States government?” Kennedy asked Solicitor General Donald Verrilli, who argued in defense of the law on behalf of the Obama administration. Chief Justice John Roberts mistakenly believes that Mississippi, which has never elected a black candidate to statewide office despite its voting-age population being 35 percent African-American, is a more enlightened place when it comes to voting discrimination than Massachusetts, which has a black governor. Amazingly, the voter suppression attempts that spread nationwide during the last election never came up during the oral arguments. The justices did not hear, for example, that six of the nine states fully covered under Section 5, including Alabama, have passed new voting restrictions since 2010. Nor did they hear that the Justice Department and federal courts blocked four major discriminatory voting changes from becoming law last year under Section 5 (voter-ID bills in Texas and South Carolina, early-voting cutbacks in Florida, and redistricting maps in Texas). Justice Kennedy suggested that another provision of the VRA, Section 2, might be able to replace Section 5. Section 2 applies nationwide, permanently, and forces plaintiffs to show that a voting change is discriminatory after it has gone into effect, whereas Section 5 must be reauthorized by Congress and is targeted, pre-emptively, only at those areas with the worst history of voting discrimination. Section 5 stops a violation before it occurs, while Section 2 can seek redress only after it happens. One puts the burden on the perpetrator, the other on the victim. Without Section 5, discriminatory voting laws in places like Florida, South Carolina and Texas would have been on the books in 2012 and could have been challenged only after years of costly and complex litigation. As Kennedy himself noted in 2009, “Section 2 cases are very expensive. They are very long. They are very inefficient.” The voters disenfranchised in the meantime would have no recourse other than the hope of a preliminary court injunction—an increasingly rare prospect in a judiciary dominated by conservatives, especially in the South. “In a world without Section 5, it would be very difficult for the Justice Department or private plaintiffs, of which there are very few, to identify the places where discrimination is happening and to be responsive enough to stop it from happening before it has a devastating effect,” says Julie Fernandes, a former deputy assistant attorney general for civil rights in the Obama Justice Department. “Is it the government’s submission that the citizens in the South are more racist than citizens in the North?” Roberts asked Verrilli. The answer, at least in political terms, is still yes. Voter suppression attempts are more frequent in the South, anti-minority views are more ubiquitous, minority officeholders have less power relative to their constituent populations, electoral maps are more segregated, and racially polarized voting is more extreme than in other parts of the country. These disturbing trends have grown worse, not better, in the Obama era. ”Although our nation has indeed changed, although the South is far different now, and although progress has indeed been made, we’re not yet at the point where the most vital part of the Voting Rights Act, Section 5, can be deemed unnecessary,” Attorney General Eric Holder said in Selma. Section 5 has been overwhelmingly reauthorized four times by Congress and signed by four Republican presidents. The last reauthorization, in 2006, is named in part after Rosa Parks. Overturning Section 5 would be the most radical decision of the Roberts Court since Citizens United, shredding decades of bipartisan precedent, and would greenlight the kind of voter suppression attempts that proved so unpopular last year. This is current history, not something from a musty textbook.